When people think of social media, they often think of selfies and posting pictures from their latest trip. 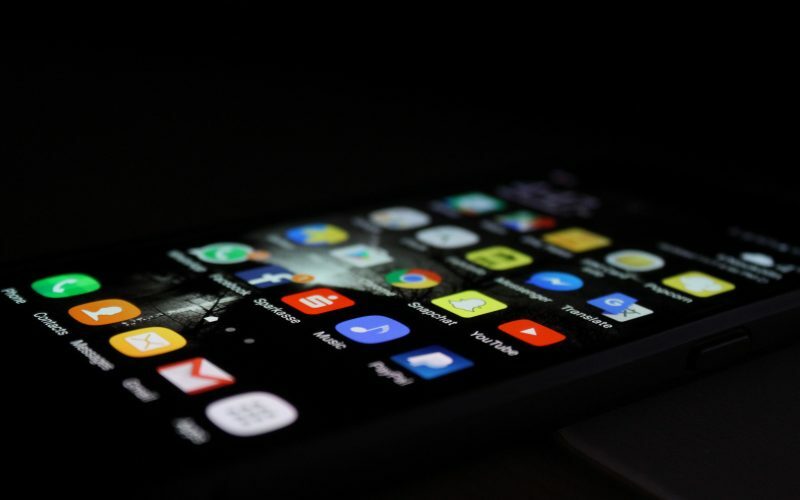 But what many people don’t think about is how important social media can be when it comes to helping out with their financial planning business. 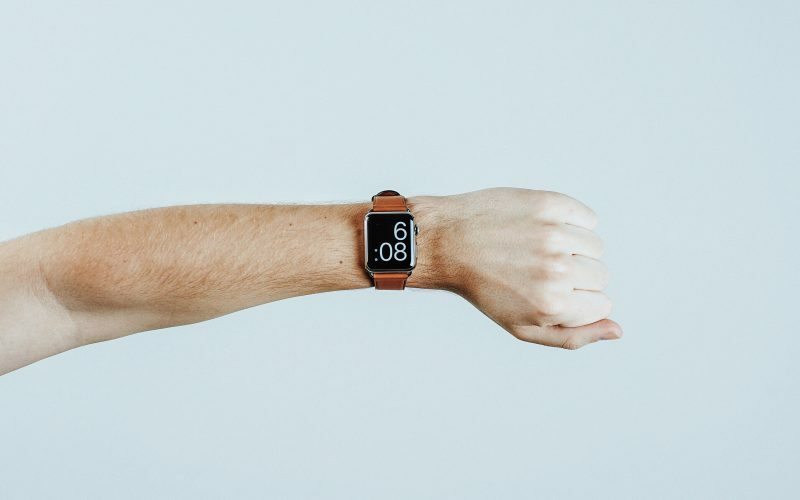 There is an abundance of data and graphs that you could spend hours and days analyzing when it comes to your social media pages, but just what are social media metrics and what should you be paying close attention to? 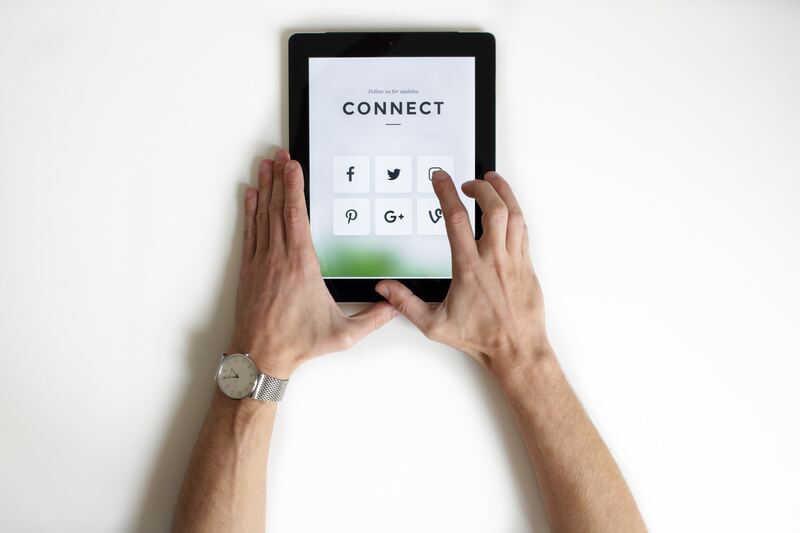 According to Sprout Social, social media metrics are data and statistics that give you insights into your social media marketing performance. There are some universal social media networks, but others vary according to their specific platforms. Metrics can also be calculated differently depending on the medium you’re sharing, so you really have to be careful when determining the kind of metrics that you are pulling. Today, we’re going to cover how to decipher your analytics for “the big three” — Twitter, Facebook and LinkedIn. 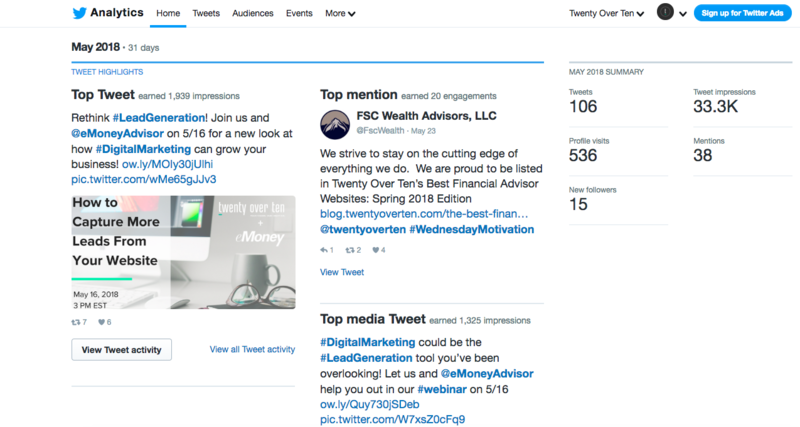 When it comes to a platform like Twitter, impressions, link clicks, retweets and profile visits are going to be a good starting place for advisors to grow your account. Profile visits are fairly basic, as it is just what is sounds like — the number of times your profile is visited. While profile visits aren’t necessarily interactions it’s important to put out material that will be of interest to your followers. Once someone has visited your profile, you hope that the content you’re producing is pertinent to them, which can in turn cause them to share this with their followers, thus expanding your firm’s reach. Impressions are equally important, because these are the instances that a tweet has been delivered to the stream of an account. So, if a tweet has 1,000 impressions, this means that it had the potential reach 1,000 people. As far as link clicks go, this is a when anyone clicks on a URL or card that is in your tweet. A good rule of thumb is to see a steady increase in your link clicks to help with engagement and audience interaction. Retweets on the other hand, are when someone reposts or shares one of your company’s tweets directly. These are important, because they can often times generate more impressions. For example, if one of your followers retweets your post, then their follower base also has the potential to see your tweet as well. Retweeting raises engagement and interaction and can potentially increase your followers if they are interested in the content you’re pushing out. The screenshot above illustrates analytics for the Twenty Over Ten Twitter account. Our Twitter analytics dashboard shows us that we tweeted a total of 106 times, gained 33.3K impressions and 15 new followers, and received 536 profile visits throughout the month of May. 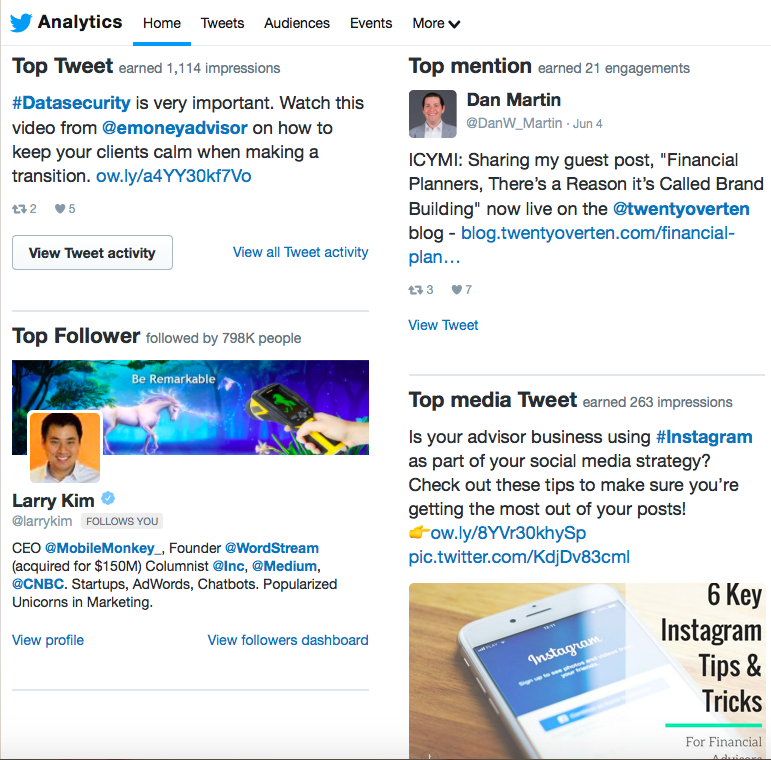 Digging deeper into your Twitter analytics you can also see which tweets received the most interaction, your top new follower, the top media tweet and top mention. This allows you to see who’s interacting with you and the type of content that you should continue to tweet. Bonus tip: Don’t forget to use hashtags liberally but strategically when constructing your tweets, as this allows your tweet to show up anytime this tag is a topic of conversation. 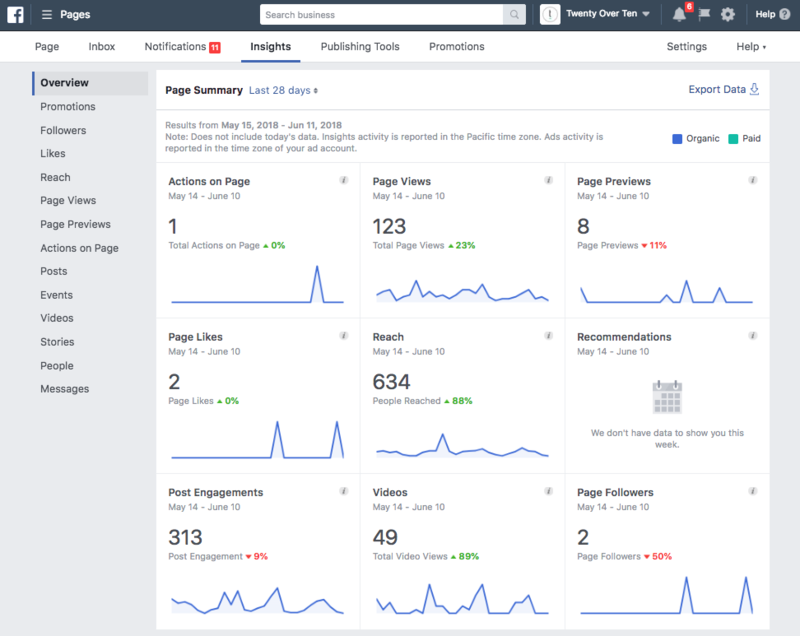 Facebook has been a part of the analytics game for quite some time now and there are many aspects to Facebook that you can analyze and adjust accordingly in order to gain more followers and potentially expand your firm’s reach. On Facebook, it’s pertinent that you work to engage with followers because this interaction is how more and more people gain visibility into your company to see what you are doing and understand. Engagement is defined as the number of unique people who have clicked, liked, commented on or shared your posts in the past week. Similar to Twitter, impressions on Facebook are the amount of people that you can potentially reach with a post. You want to try to connect with as many people as possible for exposure and the possibility to be reposted and therefore broaden your prospect base. Post reach is another important metric to track and this is the unique number of people that saw your content. 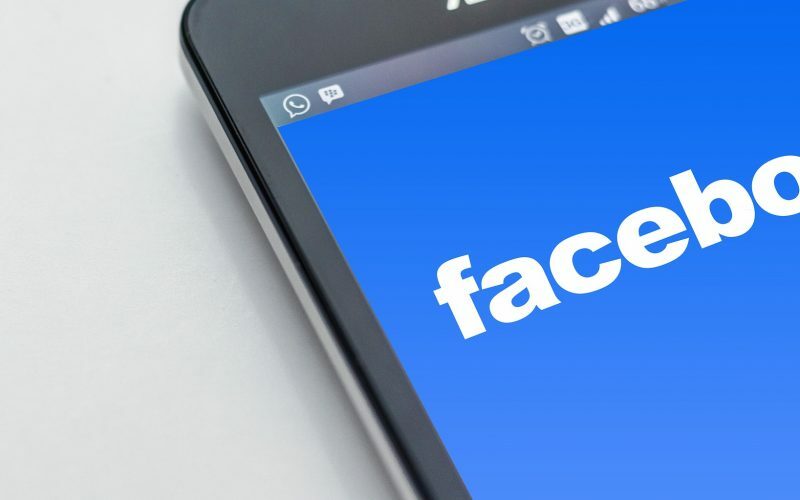 This particular metric can be extremely important, because it affects the other metrics of your Facebook business page, such as, engagement, likes, clicks and any feedback that you may be receiving. Analytics from the Twenty Over Ten Facebook page over the last 20 days showing engagement, reach, followers, and page views. 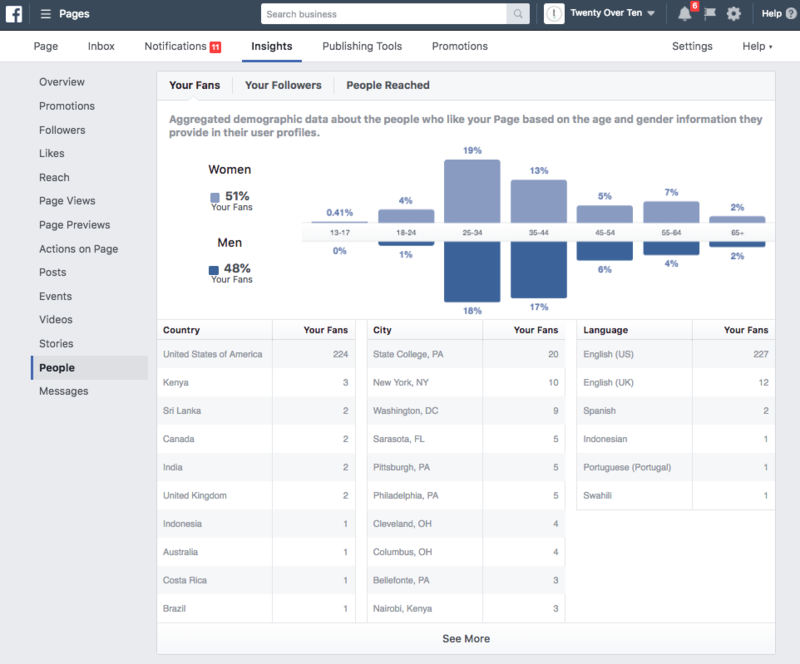 Unlike Twitter, Facebook has a “People or Fan’s Tab,” which is a great way to give a breakdown of the fan demographics of your company page. It can give your firm a good grasp on who’s currently following your business page to help inform the different types of content your fans may be interested in interacting with positively and ultimately generate more potential clients. Facebook analytics show us that the Twenty Over Ten Facebook page has a slightly higher female following with the majority of our fans based in the U.S.
Last but certainly not least we have LinkedIn. Like Twitter and Facebook, LinkedIn follows many of the similar guidelines to interact with their audience. Impressions on LinkedIn are the number of times that a post has been showed to LinkedIn members, so like the other platforms, the higher the impressions, then the more people you’ve reached. Interactions on LinkedIn refer to the amount of clicks and page views that you get, and clicks are the amount of times that your link, profile or company logo are clicked on. According to Social Media Examiner, some ways that you can increase your engagement on LinkedIn is by creating text-only posts, make sure that your updates are public and engage with others on the platform. Video is also another sharing tactic that can be used to increase your followers. Sharing third-party sources is a great conversation starter, as well. 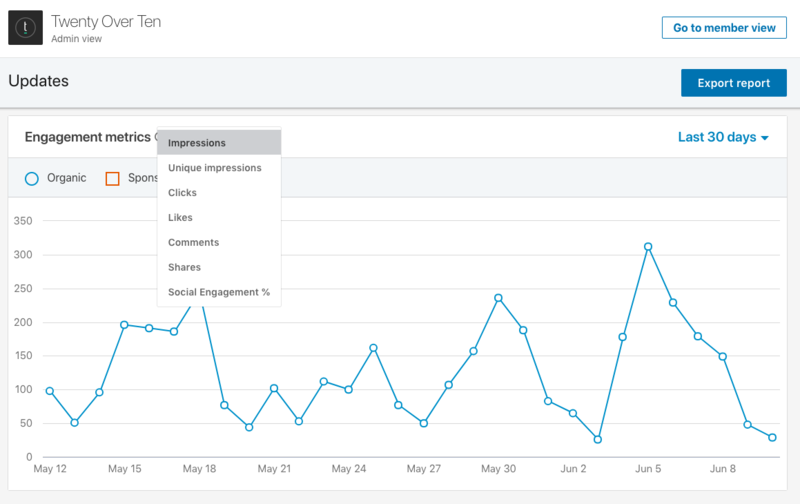 The above chart is showing impressions for the Twenty Over Ten LinkedIn page from the past 30 days. Within this same dashboard you have the option to view unique impressions, clicks, likes, comments, shares and social engagement as well. This can become a great tool for your advisor business, because after analyzing you can see what may be working for your firm versus what is not working, and you can tailor your LinkedIn content based off of this information. As you can see, when used correctly, social media is a very powerful tool when it comes to marketing your financial planning business. Your analytics go much more in-depth than this, however, this is a great start to understanding the most important metrics to keep track of for your business. Social media is a fun way to interact with customers and prospects alike and what may have started as something that people enjoyed doing to share their personal life, businesses have been able to interact with thousands of people every day and gain new clients with a simple tweet, share or post. Sign up to get social media resources sent to your inbox every month.